Tubu Tree Camp is situated in 60,000 hectare Jao Reserve which borders the Moremi Game Reserve in Botswana's Okavango Delta. The camp is a traditional style tented safari camp built on raised wooden platforms to take best advantage of the beautiful view over the floodplains. 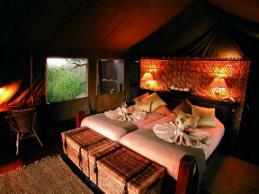 Tubu Tree camp accommodates guests in 5 large, comfortable tents, each with a small, private deck in front. 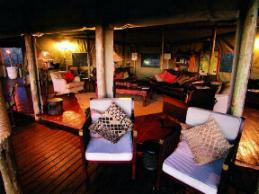 The tents each have en suite bathroom facilities as well as a private outdoor shower. The main dining and lounge areas are also large tents on raised platforms, with an outdoor pub area built under the canopy of a large Marula tree and a plunge pool built on a raised deck. Activities at Tubu Tree Camp include day and night game drives in open 4 x 4 vehicles, as well as walking with an armed guide. When the Okavango's annual flood is at its highest (normally May to late September), boating, fishing and mokoro trips are also offered. 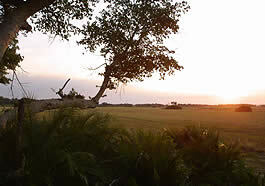 A variety of habitats ensures diverse and interesting wildlife viewing. Wildlife seen here includes elephant, Lion, Zebra, Red Lechwe, Giraffe, Tsessebe, Wildebeest as well as Kudu, Impala, Leopard and Bushbuck.